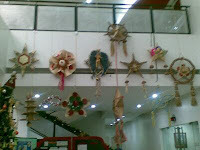 This year's entries to the Native Parol-making contest in the office. I never want to see another parol again. Well, just ranting. I am tired. Extremely. But it's okay. On our way to the office this morning, R and I were amazed that we were able to stand working on the parol for 8 straight hours. We hardly rested, just glimpsing on the what's on the tube every once in a while. Then, I told her that the drive of seeing the parol as it takes form was enough to keep me awake. As I mercifully attached each sheet of copra, I was actually excited for the finished product. Yes, I was tired. And yes, I already wanted to sleep, but I guess, when one is focused on the goal, one cannot just stand resting. One just works and works and works. OK, now that's deep. haha But it is true, right?